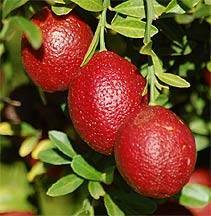 Native Blood Lime is a cross between an acid mandarin and a red finger lime. It has blood-red rind, flesh and juice. cocktails eg gin & tonic, beer.